The goal of the one-year project is to raise awareness for lung cancer screening by actively engaging patients who are eligible for screening, and by educating primary care providers in an effort to increase patient enrollment in the Vanderbilt Lung Screening Program. Using a multi-faceted approach, the project will help target specific patient populations using a previously developed natural language processing algorithm, “Smoking History and Pack-year Extraction System” (SHAPES), educate physicians and increase awareness amongst patients through various marketing tactics. Funding will be used for a new marketing campaign targeting women who are high risk for lung cancer, and who are actively engaged in screening for breast cancer with mammography. This women’s health initiative has been an important focus for Sandler and Alexis Paulson, MSN, APRN, WHNP-BC, Associate in Radiology and clinical coordinator for lung screening at Vanderbilt, since the two started working with the program in 2015. Vanderbilt University Medical Center colleagues also supporting the initiative include Eric Poulos, M.D. ; Stephen Deppen, Ph.D.; and Carolyn Scott, M.D. 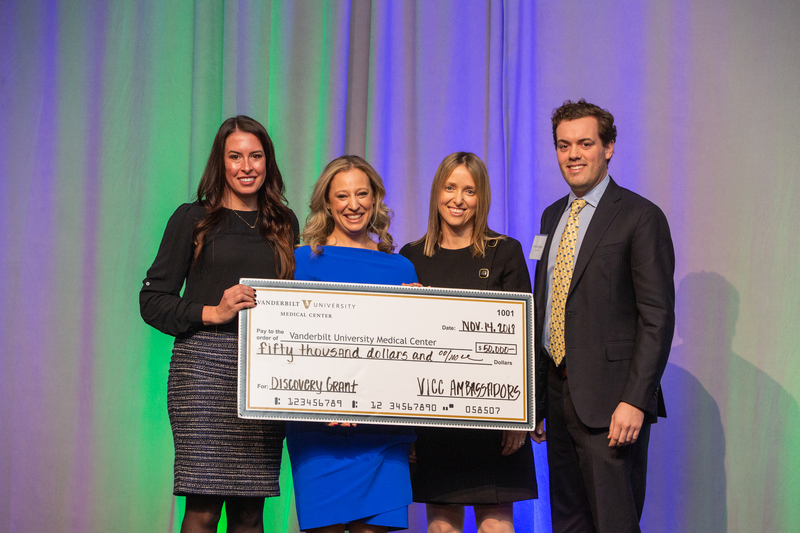 Sandler said preliminary data from a separate, but related, project funded by a 2017 VICC Cancer Early Detection and Prevention Initiative Grant was used to demonstrate the need for expanded lung screening in her application for the VICC Ambassadors Discovery Grant. “I do not believe I would have received the award from the Ambassadors without having completed the previous project,” she said. The project, which used SHAPES to identify eligible women participating in breast cancer screening to undergo lung screening, found that women undergoing breast cancer screening had a comparable incidence of lung cancer to those in the National Lung Screening Trial (NLST). The NLST itself revealed that lung screening using low-dose computed tomography reduced lung cancer related deaths by 20 percent. Sandler is expected to deliver preliminary and final progress reports to VICC in October and March 2020, respectively. She will also participate in various donor-related events with the VICC Ambassadors and Discovery Grant Program throughout the duration of the project. The VICC Ambassadors group is comprised of young individuals who have first-hand experience of patient care at VICC, and who are committed to fighting cancer through advocacy and fundraising. For more information on the Vanderbilt Lung Screening Program, and to see if your patients qualify for screening, visit vumc.org/radiology/lung.